SNEHA, a Mumbai-based non-profit, has been playing an instrumental role in improving the deteriorating health of women and children residing in the vulnerable slum pockets across Mumbai. The organisation firmly believes that it is essential to invest in women’s health to build viable urban communities. SNEHA focuses on Maternal & Newborn Health, Child Health & Nutrition, Sexual and Reproductive Health and Prevention of violence against women and children. SNEHA works at the community level (with families) as well as the with the public health system. This is to create sustainable improvements in urban health. Besides health, it has also undertaken livelihood projects for women and young adults to make them employable. Today SNEHA is the largest organisation in Mumbai working on the health issues of women and children. It has emerged as a Resource Center for all health issues for women and children. It has developed evidence-based models of intervention that are replicable by the Government and other non-profits. SNEHA has bagged several prestigious awards for its stellar performance in strengthening primary health care, specifically for pregnant mothers. It was also a recipient of a Grant from the World Health Organisation (WHO) for two years in FY12. During FY13, SNEHA established 29 ante natal care clinics at municipal health posts in Mumbai. It established 26 maternity homes, 9 peripheral hospitals, and a tertiary care center in Mumbai, Thane and Mira Road. SNEHA has been responsible for an average of 30,000 safe deliveries each year through its partner NGOs. It also addressed over 8,000 pregnant women with complications and promoted family planning to 5,000 men and women. Under its prevention of violence project, 3,000 cases of violence against women and children were resolved, over 500 women suffering from injury due to domestic violence were provided with care. As a part of SNEHA’s two pronged approach, it sensitized 1,200 police officers on prevention and handling of such cases. Over 13,000 children were screened for malnutrition in Mumbai. Of these, malnutrition in 3,500 reduced by 25% through medication and primary health care in FY13. 1,300+ adolescent girls were given training on sexual and reproductive health. Training in different vocations were given to 1,000+ adolescent girls; making them employment ready. SNEHA posted a total income of Rs56.8mn in FY13; double the income from that earned in FY12. Sources we interacted with shared that the institutional donors have remained a dominant contributor to SNEHA’s topline since past five years. Of the total income in FY13, donations (external income source) alone were 88% (Rs50.5mn) of total income. Whereas income from own sources like service charges and interest income contributed only 4% and 3% respectively. 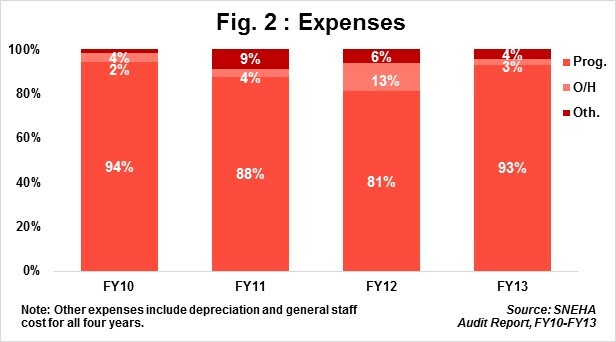 93% of total expenses in FY13 was spent directly on beneficiaries. This includes program cost, program salary cost and travel expense. Breakdown of amounts spent on each of these cost items was not disclosed in the audited financial statement. 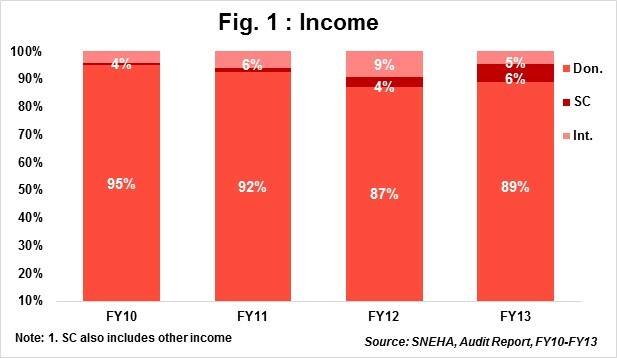 Overheads declined dramatically from 13% in FY12 to 3% in FY13; suggesting SNEHA’s efforts to realign its overheads with the sector average of 5% in FY13. SNEHA is committed towards building its trust corpus. Since FY10, SNEHA has been gradually parking funds each year towards strengthening its trust corpus and has allowed the trust corpus to inch up to Rs12.8mn in FY13. Earmarked funds at the end of FY13 stood at Rs30.9mn, +97% YoY. This fund is classified in two parts: a) Fund Raising Fund which amounts to Rs2.93mn and b) Any Other Fund which was to the tune of Rs27.9mn in FY13. Any Other Fund includes variety of projects managed by SNEHA. SNEHA has grown rapidly in past 15 years. However, total income had plateaued at Rs23-Rs27mn level between FY10 and FY12, with a CAGR growth of only 4% during the same period. 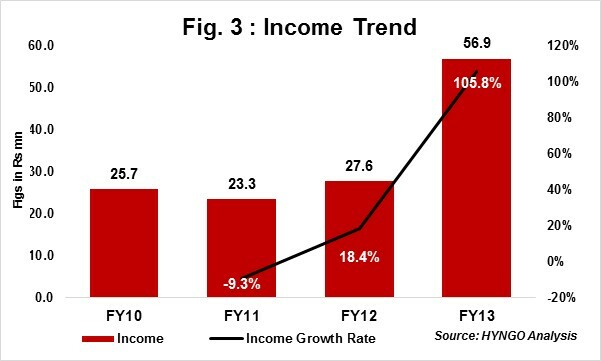 The 106% YoY income growth in FY13 raised the income CAGR to 30% for the period FY10-FY13 as against only 4% for the previous three years. SNEHA has consistently been expanding its operations since 1998. SNEHA’s increasing investment in empowering marginalized communities and reinforcing public infrastructure, which would create a safer environment for women and children, confirms its longevity and commitment towards its mission! Each project of SNEHA is funded by well-known funding agencies and institutional donors like WHO, UNDP, IDFC, Sir Dorabji Tata Trust, Dasra, HDFC Ltd., KPMG, CRY, Tech Mahindra, Ford Foundation and others. These are committed donors who have supported SNEHA for a minimum of two years. SNEHA has been constantly upgrading its services; be it capacity building for its own staff or data management techniques. The organisation gets sufficient financial backing from its committed donors. It is one of the few organisations having no major challenges. As SNEHA is largely dependent on its institutional donors at present, it might want to consider focusing on the evolving retail donor community in India to broaden and strengthen its donor base. The Board is comprised of ten leading professionals from diverse fields like neonatology, education, healthcare, finance and consulting. Each trustee, on average, has a minimum professional experience of 20 years, in their respective fields. No trustees are related to each other. Board meetings are held every quarter and the quorum set for Board meetings is six. Dr. Nayreen Daruwalla, Program Director for Prevention of Violence against Women and Children, was awarded the ‘Karamveer Puraskar’ by iCONGO (a Confederation of International NGOs) for her contribution to the field of gender based violence and gender justice. SNEHA has a robust mechanism to track its beneficiary’s health status on a regular basis. They have an integrated model that connects all Resource Centers with the Central Database Management System. Data from the field is now collected on the phone of a field worker and synchronized with cloud (virtual data management) as against making manual entries. SNEHA has used two methods of measuring its impact for all its projects – quantitative (YoY performance) and qualitative (citing success stories wherever required). The performance measurement parameters highlighted in their annual reports and on the website exhibit SNEHA’s work of excellence in terms of evaluating and monitoring its programs as well as transparency.